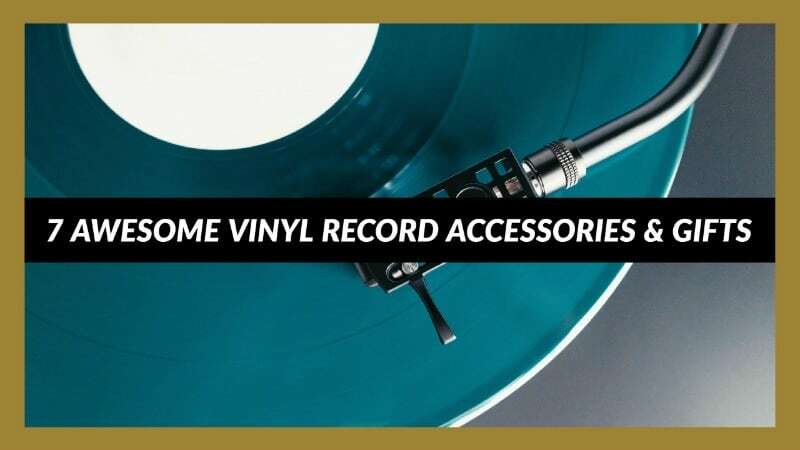 If you’re new to the vinyl record industry, you might not be aware of all the awesome vinyl accessories and available online. If you’re an established vinyl junkie, you too might just learn something new today. Here’s our list of 6 awesome vinyl gifts and accessories for people crazy about records. Some people go crazy when it comes to keeping their records clean, but can you blame them? Vinyl records cost money, and damaged ones can lead to a pretty bad listening experience. Record Butler solves this issue by preventing damage in the first place. It’s a simple record handling tool with a fleece type of material on the inside. By using this accessory, you can easily pick up records while preventing oil, dirt, dust or scratches to ruin them. What’s cool about this record handler is the fact that it doubles as a simple cleaning tool. It’s a relatively cheap way to ensure that your records last longer. Collector Protector vinyl record cleaning kit is an anti-static vinyl record brush and spraying combo. To use this product you spray the brush with the cleaning solution and then use the carbon fiber brush on the record to remove grime. The cleaning solution doesn’t contain any alcohol or chemicals that could harm your records. This toolkit not only helps to remove dirt and static discharges but ensures that your records last longer and have a better quality of sound. Clear instructions on how to use the Collector Protector Kit as well as a full 2-year warranty is given. It’s an awesome vinyl accessory while being a super affordable product at the same time. Here’s another dead simple accessory for record lovers that helps protect and lengthen the lifetime of records. It’s called a record sleeve and is probably the least stylish accessory you’ll find listed here. However, it’s worth it and very useful. It’s a plastic sleeve that fits a record with a resealable flap to prevent dust from ruining them. This is perfect for protecting album art, jackets, album sleeves and the record itself. Here’s something that has retro and vintage written all over it – B.E.G Records Drink Coasters. Each packet contains six vinyl record coasters that have non-slip bottoms and is heat resistant. Not only is this a perfect vinyl record gift for someone that loves records, it’s also super affordable as well. These record coasters look like 45’s and can easily transform you back to an area when vinyl was king! Creating clocks, wall art and furniture from vinyl records are very popular at the moment. One thing you need to start a new project is old records. Preferably you don’t want to use records out of your prized collection. If you also don’t want to go out searching through local thrift stores, you could simply order a packet of 50 random LP’s for all your craft projects. Here’s something we think is amazing. A designer called “Haddock Industrial” creates beautiful retro record lighting for everyday use. They call it rock and roll art or rock and roll décor, but either way it looks amazing! It’s a simple light fixture made out of a light bulb (Edison bulb) and a vinyl record. The designer also gives customers the option of using different colored wire cords, various shapes for the record as well as cable connections. These would look amazing in a bar or restaurant and even make for a fantastic present.